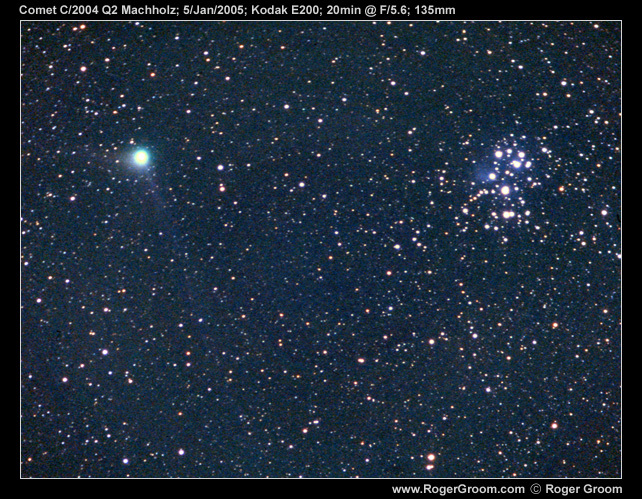 This is a photograph of the comet C/2004 Q2 (Machholz) from 2005. Taken on film using my Pentax SP1000 camera this is from before the days of digital photography and stacking many photographs. The comet is shown nicely framed with the star cluster of Pleiades (also known as the Seven Sisters). You can see a hint of the blue nebulosity associated with the Pleaides cluster in the photograph. Capturing that nebulosity with film was no easy task. Kodak E200 used to be the main stay of many astrophotographers, although I have to admit this photograph was taken on the only role of E200 I ever used. I preferred Fuji Provia 400F and used that film for most of my film astrophotography.